It has been described in previous articles but is certainly worth elaborating more on the details as such information about ninjas and needles is not easy to find and is very important to understanding the ninja. First of all, the boss of Iga (伊賀) Ninjas was the Hattori (服部) - Family. 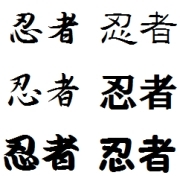 In chinese, "服部" means a specialist of weaving. Supposedly, the Hattori ninja family were originally clothing craftspeople in China and they came to Japan in ancient times. It is said that Hattori used the art of self defence by using a needle and rope for the fragile women to use. Not only that, ninjas could utilize needles in various ways. For instance, they could use a needle to make a compass in their missions, by burning and cooling suddenly a needle has a magnetic force. After that, floating the needle on water in a cup creates a simple needle. Needless to say, ninjas use needles for assassination too. I am going to introduce about the ninja art of assassination by blowing needles. There were two ways of using these needles. One was to blow needles directly from your month and the other was to blow from the pipe. When the enemy was close, they just blew needles that had been sharpened to work well from their mouths. These needles had a small triangular top for the lips to hold on to and they looked like the normal sewing needles. This type of needle is used to sew baseball gloves now. When ninja used multiple needles, they aimed at the target’s eyes. Although this seems very unfair and cruel, it was effective at getting the enemies down. 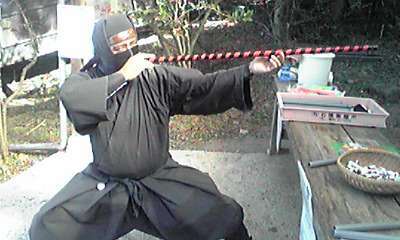 It is said that an expert ninja could accurately blow needles from a couple of meters away at a target. The true value of Ninja weapons is that they are camouflaged and never seem like weapons, ninja blowguns are no exception to this rule. Their shape is like a music pipe and actually they can be played. To be street performers is one of the Ninja disguises. Ninjas pretend to be street performers and try to approach their target. Then, they watch for the right chance and use their blowgun which is camouflaged as a pipe. 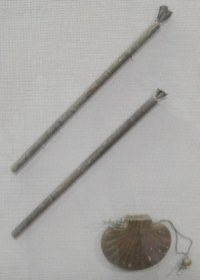 The construction of the blowgun is of course that they have several holes on the body for the scale adjustment so it can be used as a music pipe. Inside of the body however, a rolled Japanese paper is prepared. By revolving the paper, the holes can be closed then the pipe can be used as a blowgun. The arrow is also special as it is shaped like a tiny triangular needle. A needle of this type is capable of causing more damage to the enemy than a regular needle. The top of this needle is sharp and it has a small hole on the bottom for receiving the breath of a user. Poison is painted on it and the feather used on the arrow is made from Japanese paper. The range is about 10m and it is said to have very high accuracy. The blowgun can be used both in a room and outside and does not demand a strong force from the user. It’s easy to quickly remove from and conceal in a pocket and highly effective making it a suitable weapon for ninjas.